Vietnam’s textile industry has increased significantly since normalizing relationships with the United States in the 1990’s. Vietnam was granted most favoured nation status (MFN) in December 2001, which led to a dramatic reduction in import tariffs in the US market. Vietnam’s induction to the World Trade Organization (WTO) in 2007 and the Vietnamese government’s strong support of the textile and garment sector, have provided strong incentives to attract foreign investors. 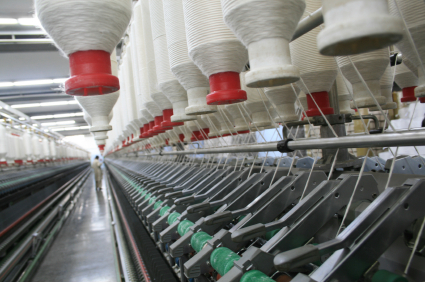 The textile industry is now the second biggest exporter in Vietnam and is expected to become the biggest in 2009. However the financial crisis has had a severe affect on Vietnam’s textile industry, which has suffered from a slump in demand from key export markets in the US, Europe and Japan. In the textile industry, companies are increasingly looking for lower cost countries that can provide outsourcing opportunities. The rising cost of land and labour are diminishing China’s labour cost advantage and Vietnam is increasingly seen as a low cost sourcing alternative to China. Estimates are that wage levels in Vietnam are about one third of those in China’s coastal region. Companies that are chasing lower labour costs are increasingly moving production to Vietnam. In a 2008 Booz Allen Hamilton survey 88 percent of companies originally chose China for its lower labour costs. Of the companies surveyed, 55 percent believe China is losing its competitive edge to countries such as Vietnam. The survey also indicated that 63 percent named Vietnam as their top low cost sourcing alternative to China. However, costs may be rising. The Navigos Group, a leading recruitment solutions provider in Vietnam, announced early in the year that there had been a 16.47 percent increase in Vietnamese workers’ average gross salaries between April 2008 and March 2009. However, low cost labour is hardly a competitive advantage in the long term. Labour cost keeps changing and today’s low cost location is not necessarily tomorrow’s viable outsourcing location. If it is not China or Vietnam, it could be Bangladesh or Cambodia. Ig Hortsmann, a professor of business economics at the University of Toronto’s Rotman School of Management notes that Nike originally off shored manufacturing to Japan. As labour costs increased, manufacturing was later moved to South Korea and Taiwan. When labour cost increased in South Korea and Taiwan, it was moved to China and later also to Vietnam. Justin Wood, a Director of the Economist Intelligence Unit Corporate Network in Singapore makes the point that in the last 15 years Vietnam has moved from a low to a middle income country. The move towards a middle income will likely put additional pressure on Vietnam’s low cost labour status. Elisabeth Rolskov, founder of ER-Couture in Vietnam, notes that manufacturing advantages in Vietnam go beyond labour cost and the country has some competitive advantages compared to China. “Vietnam has very good embroidery skills and needle work”, says Rolskov. “A lot of designers and manufacturers need embroidery skills and Vietnam has kept in touch with its traditional roots,” she adds. However, for local designers, Vietnam has limitations as a sourcing location. “Sourcing material, buttons and zippers from Guangzhou is much better,” says Rolskov. In Guangzhou you can find everything in air-conditioned shopping areas and the shopping experience is less hectic.” This can have a negative impact on a designer’s creativity as the designer is restricted by what is on offer in the local market. Rolskov thinks Vietnam is currently a great location for smaller manufacturers as the market is more flexible. “China is more volume focused”, adds Rolskov, a view supported by Rebecca Lebold, director of apparel product and technical development at Lilly Pulitzer. “Vietnam has higher production minimums than many other countries. Lower minimums would allow smaller companies to source their product in Vietnam”, Lebold notes. For many companies outsourcing to Vietnam, intellectual property (IP) remains a concern. Within the fashion industry, IP is not as enforced as it is within the film and music industries. Designers can “take inspiration” and it is seen as a major driver for setting trends in the industry. The World Intellectual Property Organization (WIPO) has called for stricter intellectual property enforcement within the fashion industry to better protect companies and promote competitiveness within the textile and clothing industries. “It is a hard thing to take care of and you just have to be faster than everybody else”, says Rolskov. For smaller designers and labels it is much easier to switch manufacturing. However to prevent the copying of designs is a challenging undertaking. For Vietnam to advance as an outsourcing location, the textile industry supply chain needs to be considered. Local logistics are influenced by direct and indirect cost. In Vietnam’s textile industry raw materials are often imported, which increases cost compared with those countries able to source locally. Managing reverse logistics can also be a challenging undertaking in Vietnam. Procedures, processes and infrastructure are sometimes not in place to manage repairs, returns and warranties. According to a new market research report from Transport Intelligence (Ti) entitled Vietnam Logistics 2009, the high cost of logistics remains one of the biggest stumbling blocks in Vietnam. According to TI analyst John Manners Bell, logistics costs are estimated at 25 percent of Vietnam’s GDP. Even with cheap labour cost, poor infrastructure remains a major barrier for entry. This is largely due to Vietnam being in the early stages of infrastructure development. Many experts believe that China’s advanced infrastructure gives it a major competitive advantage. Electricity and transportation costs will likely come down even further and and this will have a significant impact on the total cost, even if their labour is more costly. The Vietnamese government is aware of this dynamic and has invested billions of dollars in the country’s infrastructure. The government is actively encouraging foreign direct investment in the country’s infrastructure. This is visible with projects such as the Cai Mep Container Port in the Mekong River Delta and the new Long Thanh airport that’s projected to be completed by 2015. Through assessing the overall supply chain, rather than a singular focus on labour costs, it is easier to identify where Vietnam’s opportunities and challenges lie in the textile industry. While small scale designers and manufacturers take advantage of a flexible environment, infrastructure and logistics processes will need further investment to make Vietnam an outsourcing destination and source for tomorrow’s fashionista wardrobes.